VATICAN - Cardinal Filoni ordains 3 Bishops in Mongomo: "Be true, humble and generous Pastors"
Mongomo (Agenzia Fides) - Historical event for the Church in Equatorial Guinea: Cardinal Fernando Filoni, Prefect of the Congregation for the Evangelization of Peoples, this morning, May 20, presided the solemn Eucharistic concelebration in Mongomo for the ordination of three Bishops and the inauguration of two new dioceses (see Fides 17/5/2017). As the Cardinal recalled in his homily, on April 1, Pope Francis erected two new dioceses in Equatorial Guinea, Evinayong and Mongomo, and appointed Rev. Calixto Paulino Esono Abaga Obono as the first Bishop of Evinayong and Fr. Juan Domingo-Beka Esono Ayang, CMF as the first Bishop of the diocese of Mongomo. On the same date he appointed Fr. Miguel Angel Nguema Bee, SDB as the Bishop of the diocese of Ebebiyin. "We are talking about three sons of this Country", said the Cardinal, "to whom the Lord Jesus, through the rite of episcopal ordination, will grant thanks to the gift of the Holy Spirit, the fullness of priesthood". There were several Bishops from neighboring countries who were present: the apostolic Nuncio, the President of the republic and Authorities. 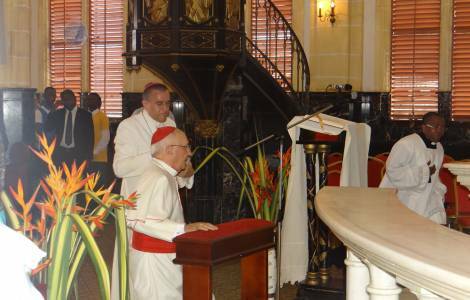 "The Church in Equatorial Guinea today lives a very important moment in its history - emphasized Cardinal Filoni. Thus, while the missionary work which already began in the past by so many brave evangelizers who dedicated their lives for the Gospel and the poor is well-founded, with the Pope's decision the intention is to proceed to a further and proper development of the Church in this Country. The present historical moment, therefore, represents the recognition of the path of maturity, both historical and underway, despite the many difficulties of the past". The Cardinal continued: "Through my presence it is the Holy Father who joins you and has asked me to show you his excitement, intending to give new impulse and encouragement to the Country and to his Church". Recalling the readings of the day, which in the Acts of the Apostles tell the life of the Primitive Church, the Prefect said: "Here too the Word of God was sown by the missionaries some centuries ago; here the first Christian communities were formed, then the first mission stations and the first parishes were born, and finally the first dioceses were created, which gave life to the Guinean Church in this land. All this was possible thanks to the Word of God proclaimed and welcomed by your ancestors. Today that work which started centuries ago continues and the Holy Father gives you three new Bishops who I am about to consecrate". Addressing directly the three new Bishops, he continued: "The Lord, through the ministry of the Holy Father, assigns you this special task: first of all be brave and true witnesses of faith, therefore supporters of the work of evangelization and servants of the People of God entrusted to you ... You are not tribal leaders or political leaders: you are, I repeat, fathers and pastors, always and for all. The Bishop's vocation is to be always and tirelessly ready to fulfill the will of the Lord". "The Lord has chosen you not for your merits; perhaps more for your limits", continued the Cardinal. "Therefore, be true Pastors, humble and generous, who understand and fulfill the needs of their faithful. Create a climate of collaboration and sharing in the priestly and religious community. Do not ever be discouraged by the difficulties. Be True Masters of Faith, boldly preaching the Word, spreading the teaching of the Church". The Cardinal invited those present to love their Bishops and priests, "not because they are perfect, but because the Lord has destined them to your service, and pray for them, so that they convert themselves to Christ every day and are faithful to him".